It’s the age old New Year’s resolution – new year means a new you! Just in time for the new year our website has a fresh coat of paint! Like any new profile picture it was time for a face lift. We’ve also re-designed a lot of our core features in the updated side panel, while maintaining what made them great in the first place. As we look forward to the new things in 2017 – we wanted FollowUp.cc to be new to not only our longtime users but for our new users as well. Our features page was re-built to be more streamlined and get straight to the point with photo and GIF examples to illustrate what our features can do for you. We created more detailed descriptions vs. the one liners we had before indicating what the core aspect of each feature was. As you scroll through the features you’ll notice after each description you can click Get Started – which installs the extension instantly! We noticed that users were missing the starting point to install the extension some how – so we wanted the ability to install the extension more readily available. If you see the feature that catches your eye just click get started. If you wanted to know the true power of the services we offer we’ve compiled them in a compact list for you to compare against our competitors. Too often you’re given the highlights of what they offer, but we give you exactly what we can do for you all in one place. As we mention here – It’s surprisingly feature-packed. 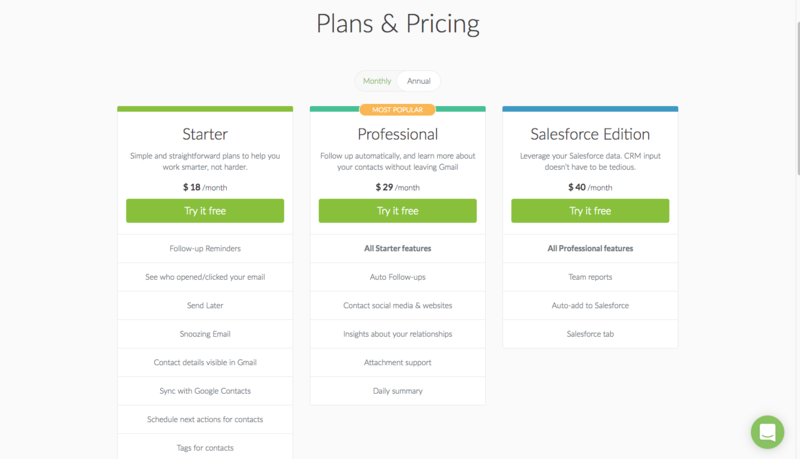 Our pricing page was redesigned as well to make it much more readable. Common questions we got in regards to pricing was what was included and what were the differences between the plans. As you can see in the picture, the higher you go up the pricing tier you get the previous tier’s features included. You also don’t have to scroll down to see each plan’s features now as well. 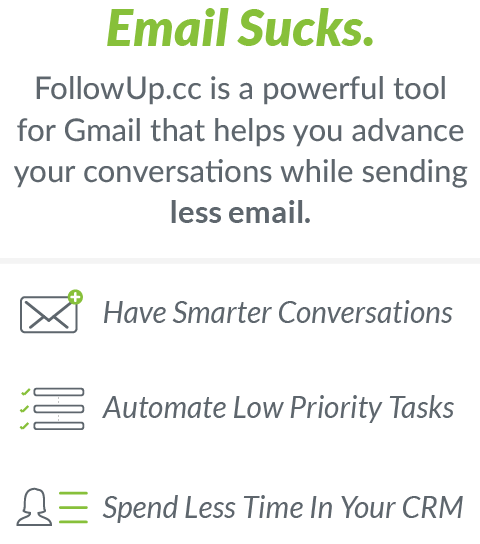 Are you using FollowUp.cc with a team? 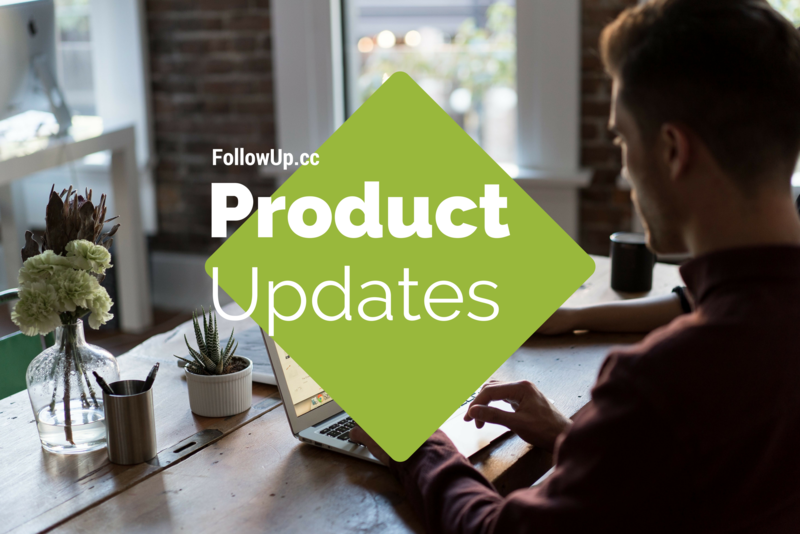 Be sure to contact us about Team pricing via email support@followup.cc. You may notice a new look for your sidebar. Now you can access your contact list by clicking “Browse People & Companies”. This will pull up your contacts (which we discuss more about those changes below). Next is your reminders. You can view your reminders for the week. 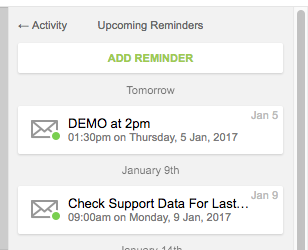 Clicking on the reminder gives you the option to reschedule it or cancel it all together. Both of these actions happen in the sidebar instantly so you don’t have to leave your inbox. While you can still log into our website to accomplish this as well – our goal was to give you the option to not leave your inbox unless you have to. 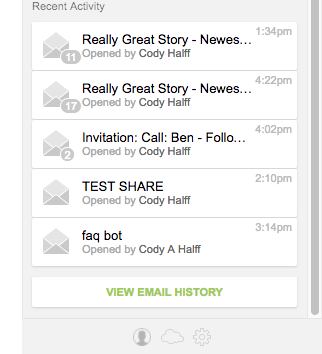 The final part of this new sidebar view is your tracked email notifications. These are the same notifications you always had. Now when you click on an email (pictured left) you can view the email, see who it was opened by & what time (in this case one person), and who was included in this email. 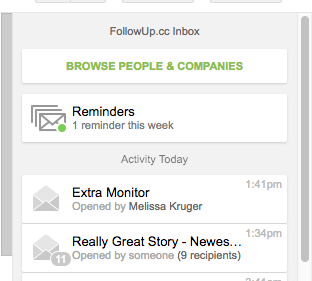 View upcoming reminders and record important notes you want to keep about this contact. These notes also store in your Google contacts. 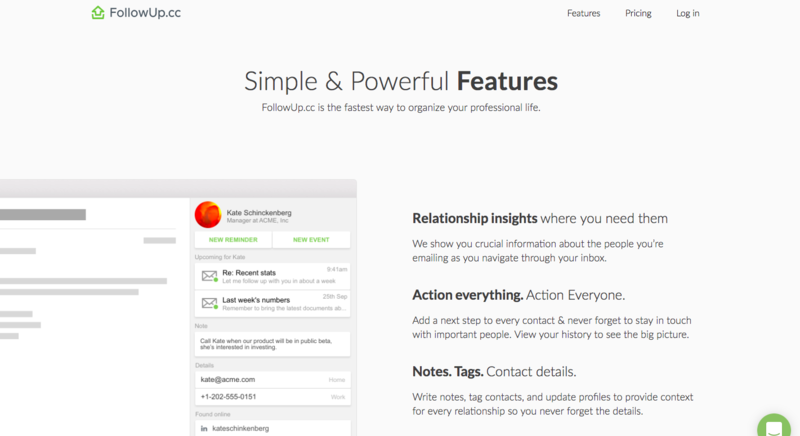 View your entire email history with that person. Pretty self-explanatory, but we provide all of your contact history in one place right from your inbox. This would for recalling what you might have already discussed with them. We cannot thank all of our current users enough for using our product and helping us make it even better. Looking forward to 2017 – we can’t wait to help you improve your conversations with our new lightweight CRM features and staying on top of your emails. If you’re new to FollowUp.cc, welcome. We’re glad you stopped by. Here’s to fantastic 2017!